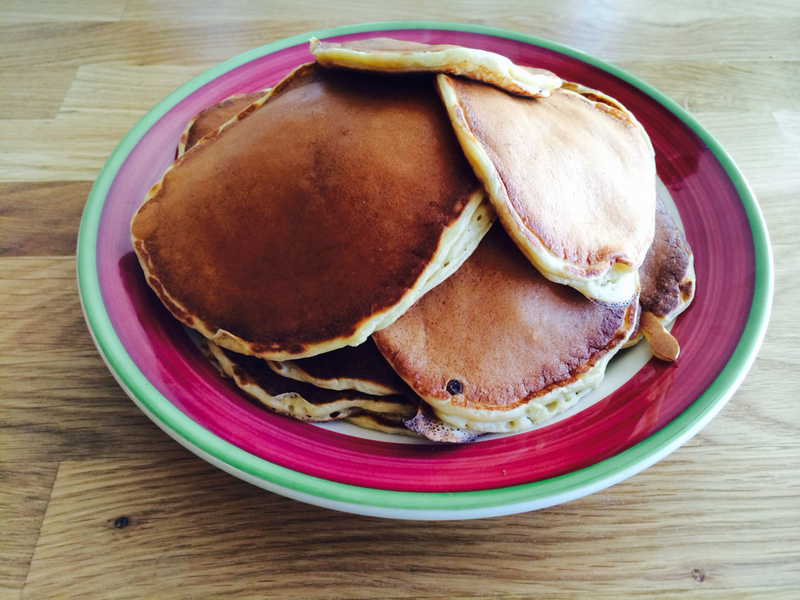 In the 2nd official post of my continuing pancake series i present Banana Pancakes! not a huge departure from the first recipe, but its what i had on hand this weekend! The Recipe is essentially exactly the same as last weeks. 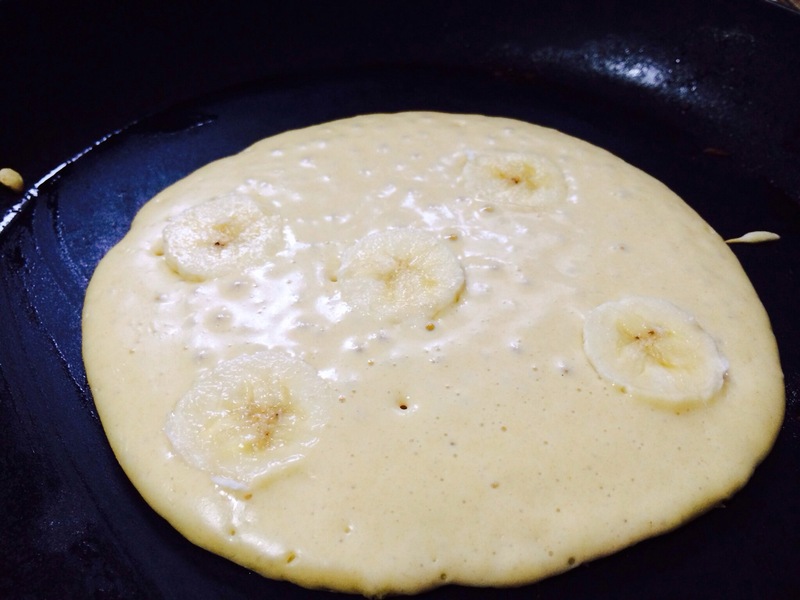 We’ll call that the Master Pancake Recipe – but this time banana’s are added for extra deliciousness! I did do one thing differently, and that was to extend the resting period for the batter. Instead of letting it just rest for 30 minutes, i actually made the batter the night before and let it rest overnight in the fridge. This lets the gluten in the flour relax, and lets all the ingredients to really meld together well. In the morning it just has to be whisked up a bit again! The result was a much silkier pancake, that was very moist. The Bananas are added to the pancakes while they are cooking. After pouring the batter into the pan, add a few slices of banana. Let the pancake cook until it gets a bit bubbly, and then flip! It all results in a stack of delicious pancakes. I went classic with this and went with butter and maple syrup. somewhere though in the back of my mind i wanted some nutella for this… but we’ll save that for another day! I’ve been wanting to start a special series for a while now, and seeing as it’s the beginning of a new year I thought now would be the perfect time to start. Usually on Sundays I have a craving for pancakes, a craving which I try to satisfy to the best of my abilities, either by making my own or finding my way to an establishment which serves excellent pancakes. When I make them myself, I always try new recipes and methods to come up with the perfect pancake. There are pancakes from all over the world and all of them are very different, some are fluffy and thick, while others are thin and silky. Some are more eggy and some are more cakey. So! My idea for this series is to make a different kind of pancake every week, and to post every recipe and different method as I go. Which means eventually I should have around 52 different kinds of pancakes!!! That’s a whole lot of pancakes!! In a separate bowl mix all the wet ingredients. Stir together very well until all the liquids are combined. For best results i like to let the batter sit for about 30 minutes. This lets the flour break down a little and absorb some of the milk – which leads to a silkier pancake. Heat a pan on the stove, you want it at a steady medium heat. Add some butter, and let it melt. Pour batter into the pan to your desired pancake size and Cook until the top is bubbly. Flip, and cook for a couple of minutes on the other side. If you need to adjust the heat, turn it up or down until your pancakes are perfectly golden brown! Serve with butter, maple syrup, jam, and or honey. 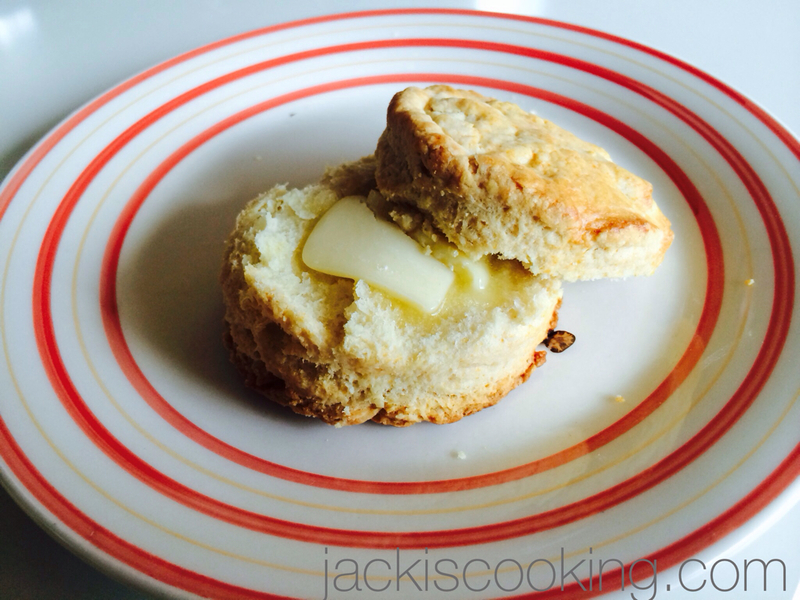 Today’s post is a quick and simple recipe for biscuits that’s easy to whip together in the morning. I made these a few days ago because I had no eggs to make pancakes. 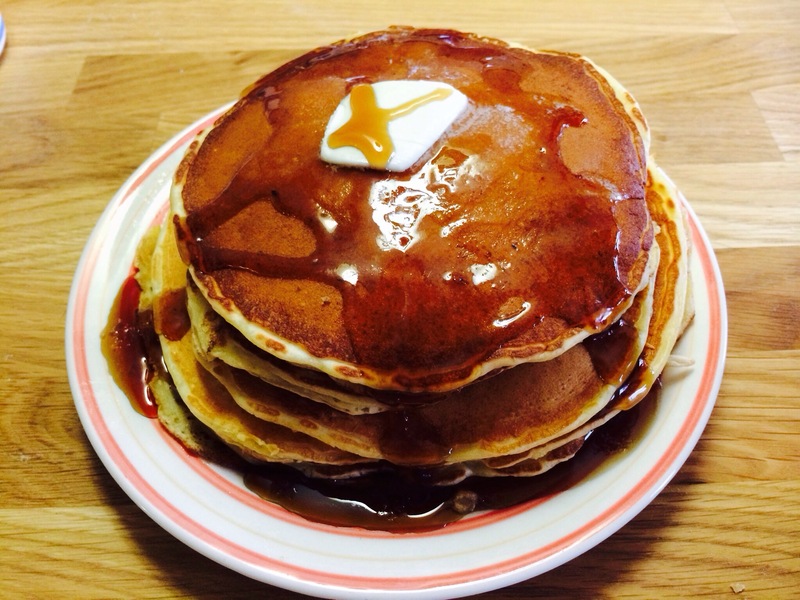 Speaking of pancakes, I have quite a few pancake variations to post so keep your eye out for those! But biscuits! there are a few key tips to success. The first is the butter has to be really really cold. The second tip is that the amount of milk needed changes day by day depending on the climate you are in, so you have to just experiment a little. The third trick is that the cutter has to be sharp. You want the dough to be cut right through so that the edges of the biscuits are straight up and down. This allows the biscuits to rise a whole lot more! If the cutter is blunt the top of te biscuit will be pressed down and can seal with the bottom, preventing an even rise. 7 1/2 tablespoons of ice cold butter cut into small pieces. First! Mix all the dry ingredients together. Then take the cold butter cubes and mix with the flour mixture with your hands until the butter and flour have combined into a rough mixture. You want the texture to be kind if sandy. Take the milk and slowly add it bit by bit. You want just enough so that the mixture just sticks together. You want it to remain fairly dry though, so that it can be rolled out. If it does get too wet though you can make drop biscuits by spooning the mixture out. Roll the mixture out on a floured board, until it’s about 3/4 inch thick. Using a round cutter, or a glass cut out as many biscuits as you can, re-rolling the remaing dough and cutting more out. I made about 6 biscuits altogether. Brush the tops with a little milk and then bake them at 375 for 20 minutes until they are golden brown! Serve while hot with butter and jam, or my favorite with some honey! I’ve got another beef shank recipe here, this one is based on the classic Beef Bourguignon, the famed french dish which Julia Child was so fond of. It’s so classic in fact that there’s really not much to change, but usually this would be made with a different cut of beef. I however love beef shanks because of the delicious marrow filled bones. I have discovered that any kind of stew, or meat dish that needs to be cooked for several hours benefits immensely from the addition of bones while its cooking. Theres something special that happens, that i am sure there is some scientific explanation for, but it makes a huge difference not only in terms of flavor, but also in the tenderness of the meat. The bones are removed at the end, so you still get the classic presentation – you can serve this on its own, with potatoes, rice, or my favorite – with noodles. 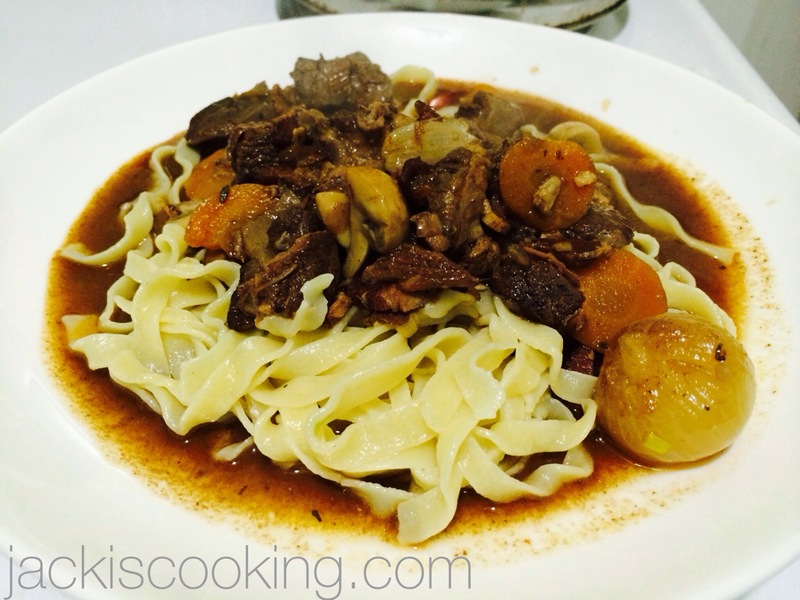 This dish can be made on the stove in a heavy pan, but again i used my wonderful slow cooker. I even did all the prep work the night before, and then put everything in the slow cooker in the morning. When i came home 6 hours later, it was just about done! 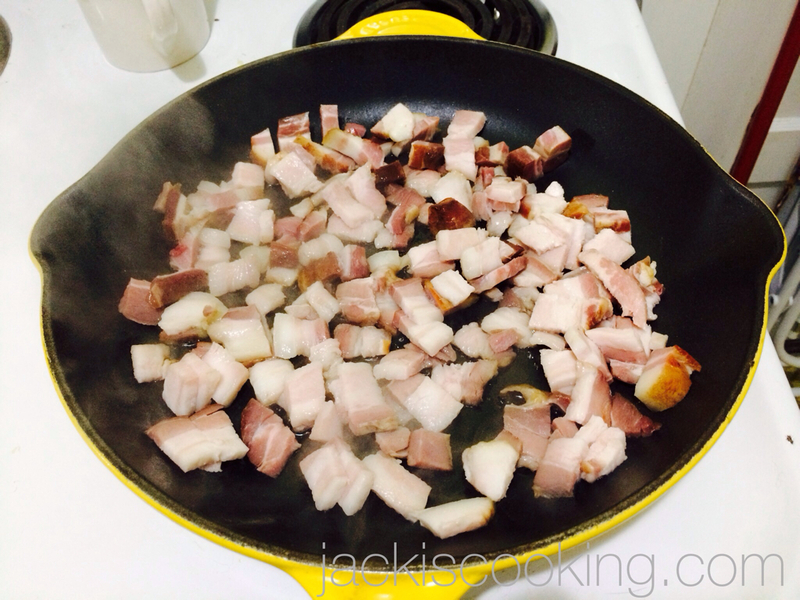 -1/2 lb Bacon – JACüTERIE Italian Bacon works great here! First – cook the bacon until it’s nicely browned. Strain the bacon but retain the drippings. 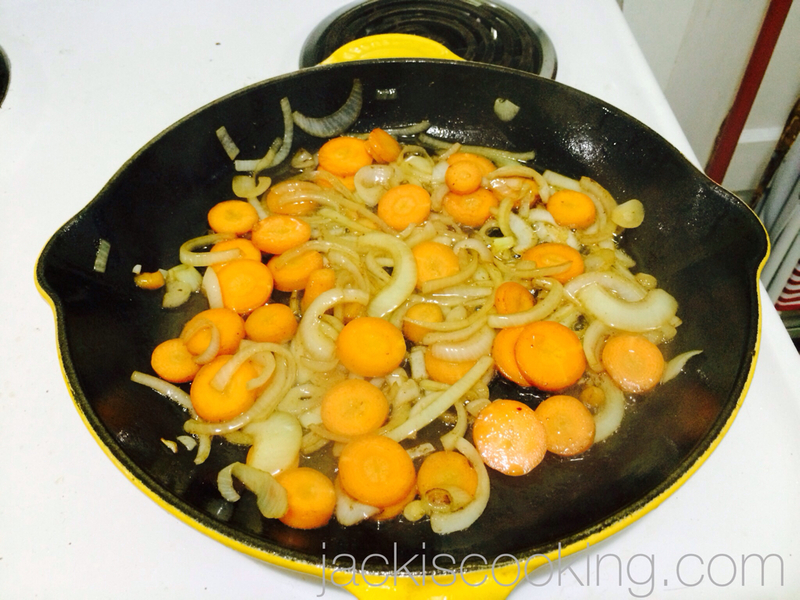 Set the onions and carrots aside. Using some more of the bacon drippings, brown the beef and the bones on all sides until they have a dark brown crust, but aren’t cooked all the way through. Set the beef aside. Everything else just has to be portioned out! 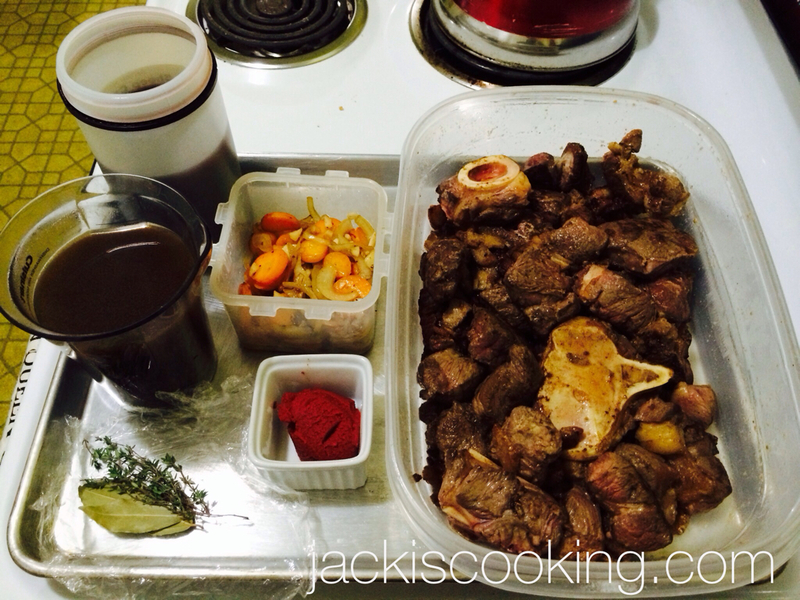 I get everything ready the night before, so in the morning I can just throw it all in the slow cooker quickly! Later that day, about an hour before you are ready to serve, the pearl onions and mushrooms need to be made. For the onions remove some of the juice from the slow cooker, and slowly cook the onions in the juice for about 45 minutes. 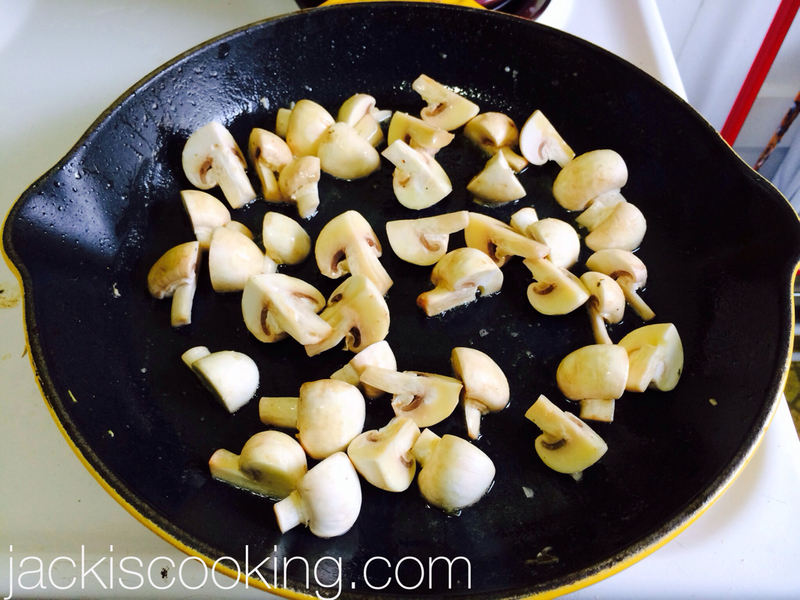 Sauté the mushrooms in butter until they are nicely browned. Set these aside for now. The last step, strain the meat from the liquid so that the bones can be removed. Set the liquid in a pot over the stove and cook on a higher heat to reduce the liquid and thicken it up a little. Once it has reduced by one third, add the meat back, the pearl onions and the mushrooms. Serve with potatos, rice, or noodles! I recently got a nice slow cooker, so i’ve been experimenting with it quite a bit. One of the first things i made in it was some awesome beef broth, which i used to make a Vietnamese pho with. Pho is basically a soup, except you can put whatever you want in it. the most important thing to have is a delicious broth to begin with, and it has to be super hot! Then you put some noodles in a bowl, along with any other ingredients you want – meat, vegetables, peppers, sauces, and/or oils before pouring the piping hot broth over. The broth cooks all the veggies and you have one delicious meal. 1 large beef shank or 2 small beef shanks (about 1.5 lbs bone included). 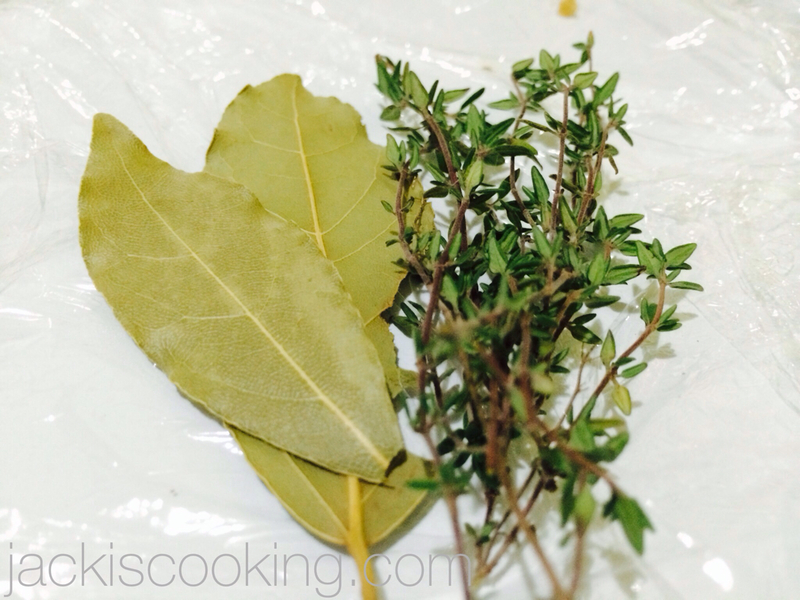 Theres just a few steps to take care of before throwing it all into the slow cooker. This could also be done on a stove in a heavy pot or dutch oven. The first thing to do is to cut the meat off of the bones, and cut into bite size pieces. Set a pot of water to boil, and add the bones and the pieces of meat. Cook just for 2 or 3 minutes. This is just to blanch the bones and the meat, a lot of scum will come out and settle on the top of the water. Scoop this away and discard. This prevents the broth from becoming cloudy. If you are adventurous enough to have 3 things going, take a small skillet and toast all the spices over a medium heat. After toasting take a piece of cheese cloth, or spice bag and tie all the spices up in a neat bundle. 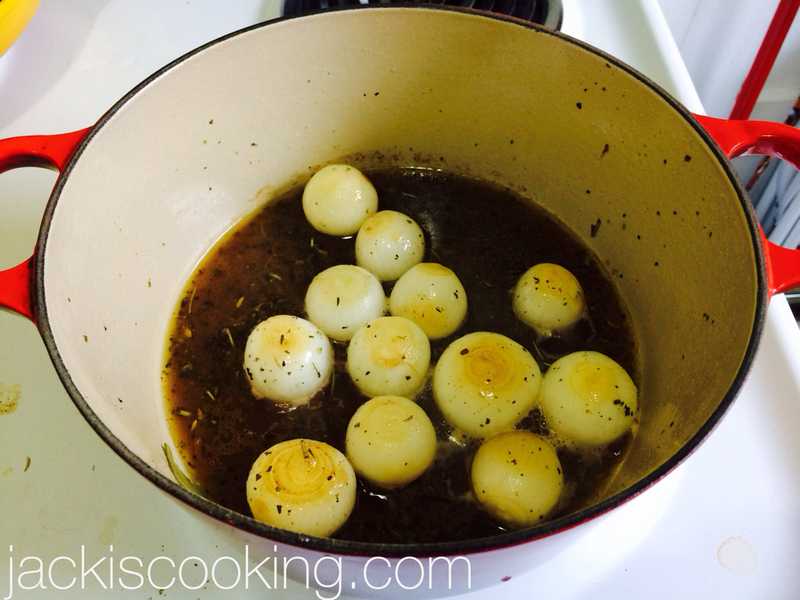 This also makes the broth wonderfully flavorful, but prevents the broth from clouding also. Remove the bones and the meat from the water and discard the water. 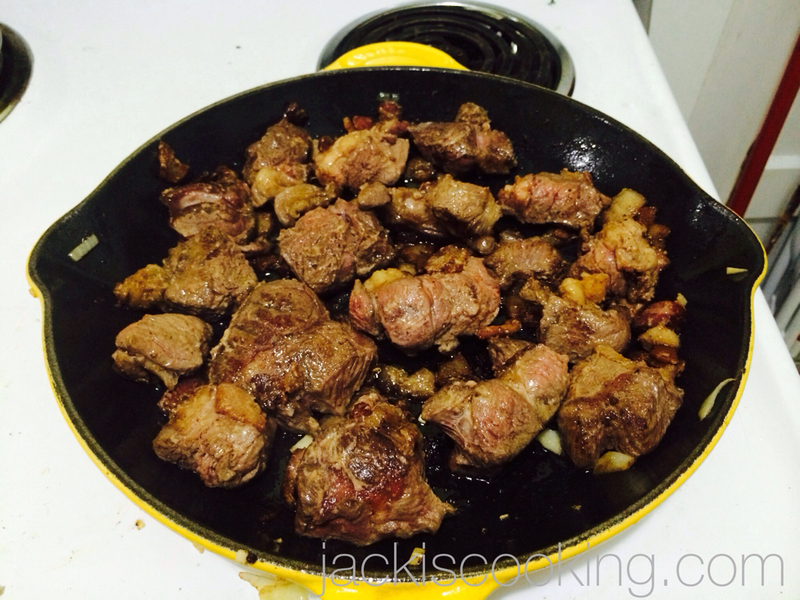 Place the meat and bones in your slow cooker, or in a heavy cast stove pot. Throw in the 5 cups of water, the spice packet, the roasted onions and ginger, the fish sauce, beef bouillon, salt, and sugar, set the slow cooker on low and let it cook for about 6 hours. If you are doing it on the stove, set the stove to the lowest it can go, and cook for at least 2 or 3 hours – replenishing some water if you need to. After 6 hours take the broth and strain it into a pot over the stove. Discard the bones and spice packet, and set aside the meat. Bring the strained broth to a rolling boil and get ready your bowls of other ingredients. 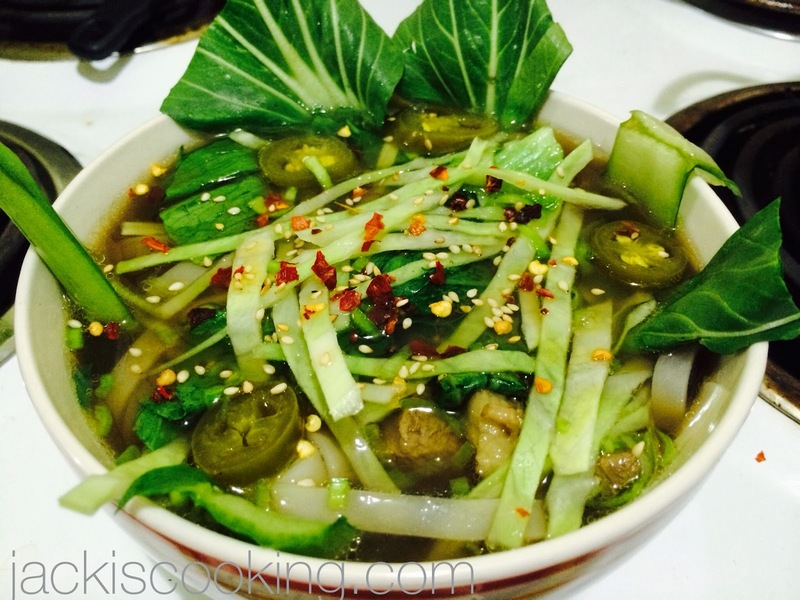 The particular pho that i made, i did so with meat, onions, and ginger from the shanks, rice noodles, bokchoy, cabbage, and pickled jalapeños. Place everything nicely in the bowl, and then pour the piping hot broth over. The broth will instantly cook all the veggies. Garnish with some sesame seeds, crushed red pepper, and a little sesame oil.